This is an exhibition in which each painting’s title is as precise as the brushwork. View of a Street in Østerbro Outside Copenhagen, on the Right ‘Rosendal’, in the Background ‘Petersberg’ is a case in point. As in much of the work of Christen Købke a soft light picks out detail which may or may not be authentic. In Frederiksborg Castle, View Near the Møntbro Bridge, he has no qualms about airbrushing a too-modern 18th century staircase out of the scene. Elsewhere in Portrait of Naval Lieutenant D. Christian Schifter Feilberg he includes a small window, but the finicky touch appears reflected in the end of an epaulette. There can be no doubt, Købke was an idealist. Recent history, such as the Napoleonic Wars, may have ravaged his homeland but he responds with landscapes and portraits of meticulous calm and a warm, often rosy light. The only hint of trouble is found in his bold compositions. The Danish painter crops buildings and goes with unusual perspectives. In Roof Ridge of Frederiksborg Castle with a View of Lake, Town and Forest it is the sky which fills most of the canvas. But Købke’s skies, whether blank, white and eternal, or filled with solid, static clouds also belie the passing of time. 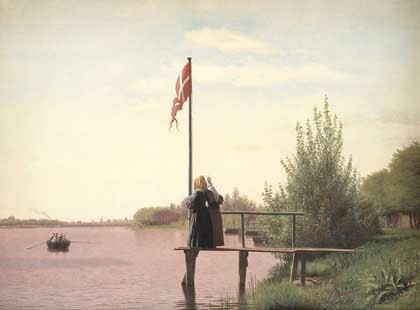 Meanwhile, he paints the national flag, in View from Dosseringen Near the Sortedam Lake Looking Towards Nørrebro, with too much slow care for it to flutter. But this was in one sense Denmark’s Golden Age. The arts were thriving. Both Søren Kierkegaard and Hans Christian Andersen were then writing. These were the good times which Købke’s aspic-like pictures did so well to preserve.